The DARPA Tactical Technology Office (TTO) cultivates high-risk, high-payoff tactical technologies. Aerodynamicist Ashish Bagai came to the TTO in March 2012 from Sikorsky Aircraft, where he led the aerodynamic design of the rotor blades for the company-funded X2 high-speed helicopter that in 2010 achieved a top cruise speed of 253 kt in level flight. His TTO portfolio today calls on the technical community to make other Vertical Takeoff and Landing (VTOL) concepts faster and more efficient with equally innovative engineering. Dr. Bagai joined AHS International as an undergraduate in 1989. "As the premier organization involved in the exchange of technical information related to rotorcraft, AHS offered me an opportunity to interact with the most prominent researchers in the field worldwide. AHS has always been generous – permitting students to serve as volunteers in exchange for [free] Forum attendance,” and other benefits, says Dr. Bagai, who has served in several official capacities, including as chair of the Aerodynamics Committee and a member of the History Committee. As a technical reviewer and later Associate Editor for the AHS Journal, he has been an active member of the Society. "The opportunities were like a parallel career path," says Dr. Bagai, “offering an opportunity to serve and excel, while contributing to the technical community." He also served as the Forum 66 Technical Chair, when the Forum was last held in Phoenix in 2010. Like the XH-59A that tested the Advancing Blade Concept in the 1970s, the new high-speed demonstrator stacked coaxial rigid rotors to overcome retreating blade stall. “It’s still an edge-wise flying rotor,” notes Dr. Bagai. “When Sikorsky set out to do the X2, they set some very firm key performance parameters that were going to address the shortcomings of the original concept. These included improving the aerodynamic efficiency of the rotor system, and that was the challenge I was faced with – specifically the design of the rotor blades.” The X2 blades ultimately combined a non-uniform planform with positive and negative twist and a complex distribution of modern airfoils and thicknesses to derive their aerodynamic properties. An upcoming BAA likely will focus on VTOL X-plane technologies that increase speeds dramatically, improve hover efficiency and hike the efficiency of helicopters or some other VTOL aircraft, all without giving up the useful load of the aircraft. “The design space I intend to look for – in the VTOL X-Plane program specifically – is you have these performance objectives, and they dictate some form or configuration of aircraft. It may be a tiltrotor, a tiltwing, some combination of lifting fans. Whatever it is, I don’t think that’s where the design stops. The next step is recognizing what are the subsystems that go into this to enable it to be successful, above and beyond what we’ve done in the past. 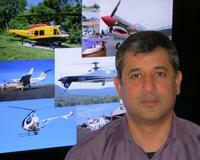 Dr. Bagai expects VTOL designs to take different paths in the coming decades. “I think it will depend a lot on the weight class of rotorcraft. I think if we have the current system of propulsion or power systems, then the large open rotor is difficult to dispense with because it is the most efficient means of hovering. If you have a large hover-duty cycle, I’m not sure there’s much of a way around that. But on the other end of the spectrum or closer to the middle in the weight class categories, I think we’re likely to see quite a dramatic change in concepts.